So, the kiddos and I are headed to my BFF’s house for a pizza party/Wii party. We both have hubbies that are not going to be around this evening, so what better time to get the kids together and have some good, clean fun. Although we are planning on ordering in some pizza. I told her I would take care of some kind of snacks for the kids. I hadn’t made my peanut butter popcorn recipe in awhile, so this was perfect. My crew LOVES popcorn–seriously, we are getting to the point of making almost a bag of the microwave kind for each child. They also pretty much love anything peanut buttery, so it’s all good. Warning: this is highly addictive stuff! I have to get this in a bowl with a lid to remove the temptation of gobbling the whole batch down, especially if it’s one of those days. Love that little hand sneaking in a bite! Heat oven to 300 degrees F. Spray 2 baking sheets with non-stick spray. 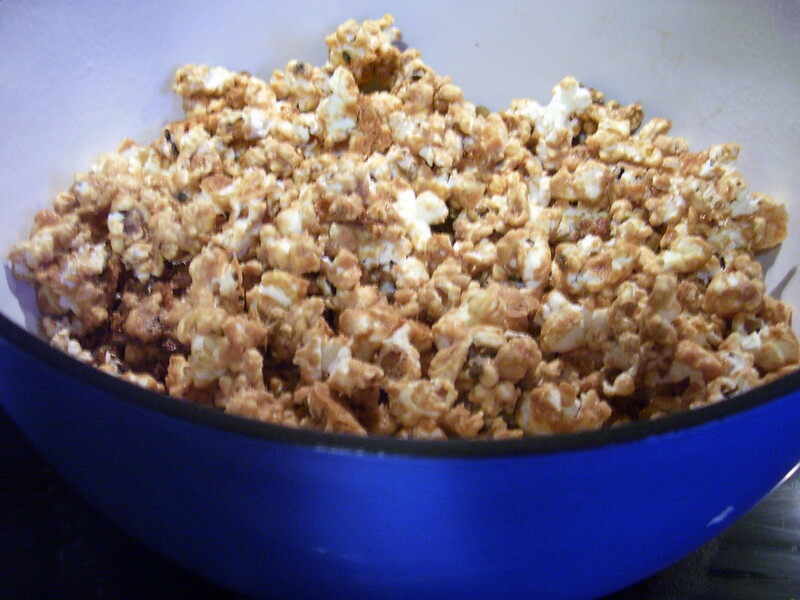 Place popped popcorn in a very large bowl or Dutch Oven. Combine peanut butter, corn syrup, butter, and salt in a medium saucepan. Stir constantly over medium heat until mixture begins to boil. Remove from heat, add vanilla, and stir to combine. 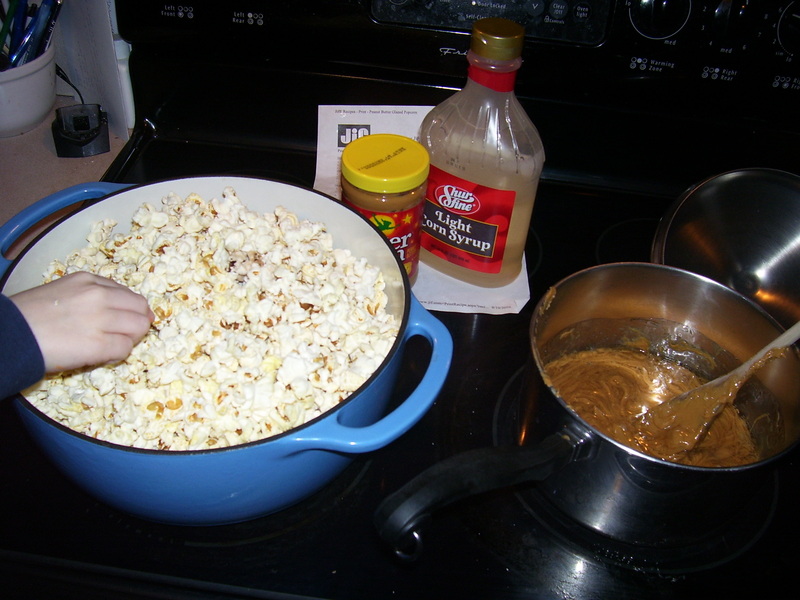 Pour warm mixture over popcorn and mix very well to evenly coat popcorn. Spread evenly over baking sheets, bake 20-25 minutes, stirring halfway through. Remove and allow to cool. A perfect blend of crunchy, salty, and sweet. 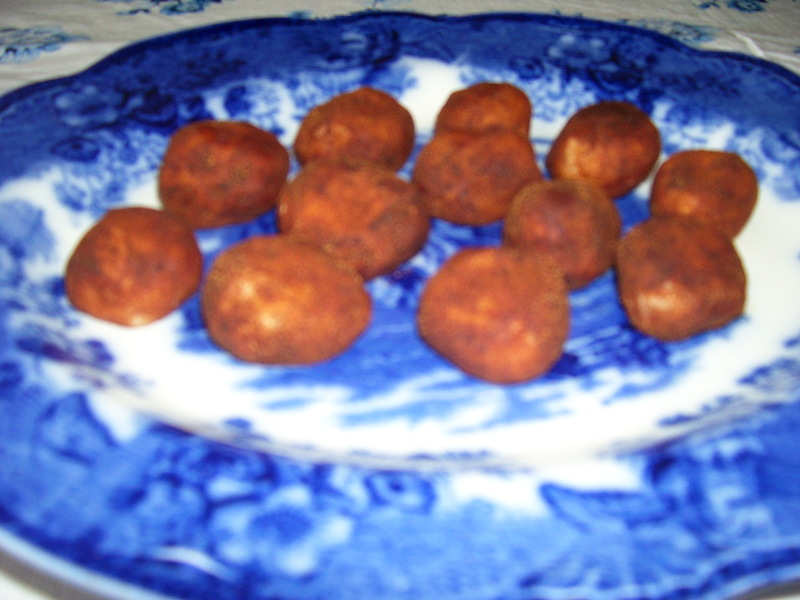 Today I am sharing with you my recipe for Irish Potatoes. In case you’re wondering, mine aren’t actually made out of potato at all. There’s some recipes out there that actually use mashed potatoes–mine does not. A dear friend and neighbor passed this recipe on to me a couple of years ago right before St. Paddy’s Day. It’s definitely a keeper! If you have no clue what Irish Potatoes are, they are a sweet candy. Granted, they certainly aren’t beautiful (hence the pretty plate in the picture!) but they are really good. This is a simple recipe, and no baking is involved. If you like to get your kids involved in the kitchen, this is a good one for them to help with. My kids helped mix the dough, roll the balls, and roll them into cinnamon. Also, this is a recipe that is quite easy to double or triple if you’re making sweets for a crowd. 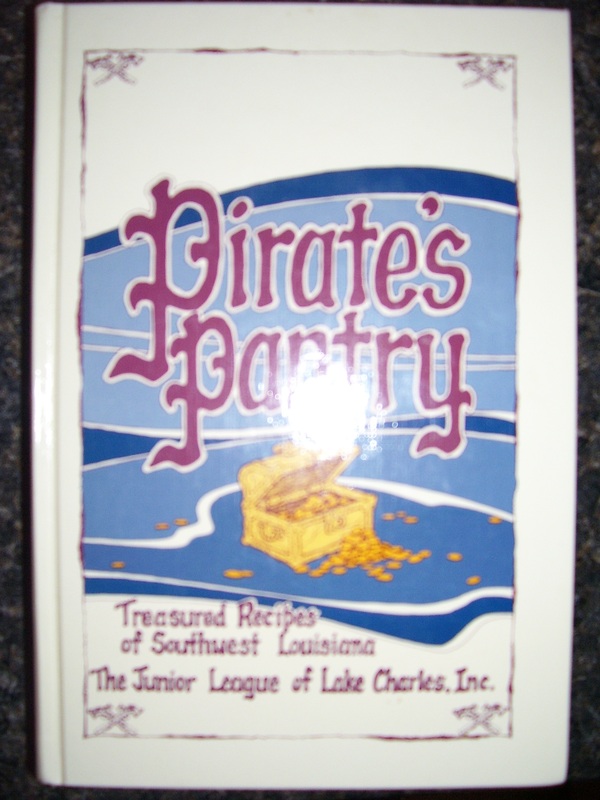 One of our fave cookbooks!In it you can find a multitude of recipes, anything from gumbo to icebox cake to fried alligator. There’s even illustrations for skinning wild game! Ha–in case you’re wondering, those are NOT ones I am planning to try or blog about. Nothing too gamey for this girl. Anyway, we decided to do a little cajun feast for ourselves and my brother-in-law today. What was on the menu? Red beans and rice, skillet cornbread, and cabbage Heidi. (And yes, I have a daughter named Heidi as well, pure coincidence!) All I can say is there were some incredible smells emanating from our kitchen, and when we dug in, there was no disappointment! Mmm, Mmmm, Mmmmmm… Sound delectable? Give it a try! The only thing we were missing was fried shrimp and sweet tea. Saute sausage and veggies in a large skillet with some olive oil. When veggies are soft, add kidney beans and tomatoes. Simmer for 20-30 minutes. Serve with rice. Dig in! Cut bacon into bits and brown with chopped onion. Add all of the other ingredients except sour cream. Simmer, covered, for about 30 min. Add sour cream a few minutes before serving and heat through. Enjoy! 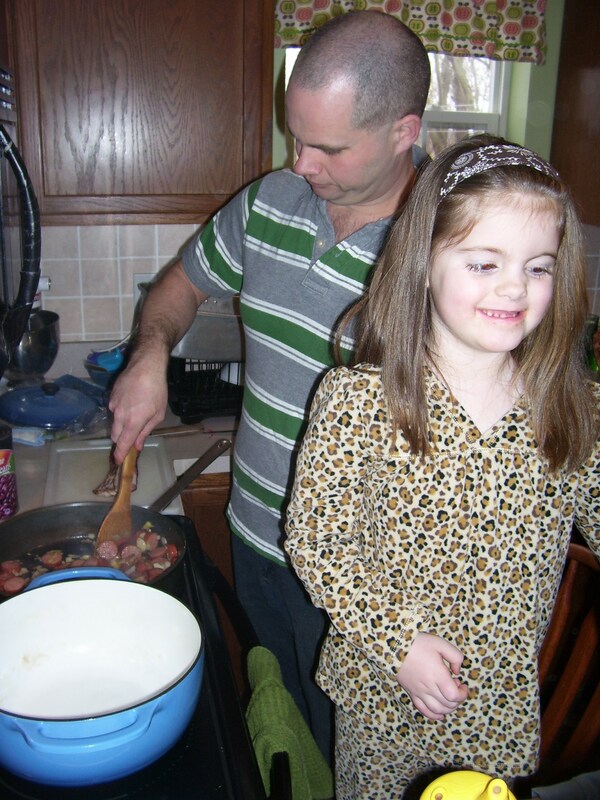 Our very own Heidi, cooking up a storm with her Daddy. I served skillet cornbread with our meal. I’ll admit to the fact that I used a mix, though I often make it from scratch. By the way, it was a Marie Callender’s mix and it was darn good! Do you have a bunch of these lying around? Or maybe ones that look even worse? Here’s a new way to use those babies up! Banana bread or banana nut muffins seem to be my go-to default for using up overly ripe bananas. One evening recently my dear man decided to bake something with the kids. If you’re wondering if this happens very often in my house, it actually does, no joke! Though they love to help me in the kitchen, as soon as Daddy goes near the stove, I hear screeching chairs being pulled across the kitchen floor. Before we know it, he has at least a couple of helpers up on chairs, ready to be put to work. Can I just say how much I love him for this? Besides the fact that he loves to cook and bake (I admit, totally better than I do!) he loves to involve the kids and get them in on the action. Yes, sometimes he’s a way better parent than I. 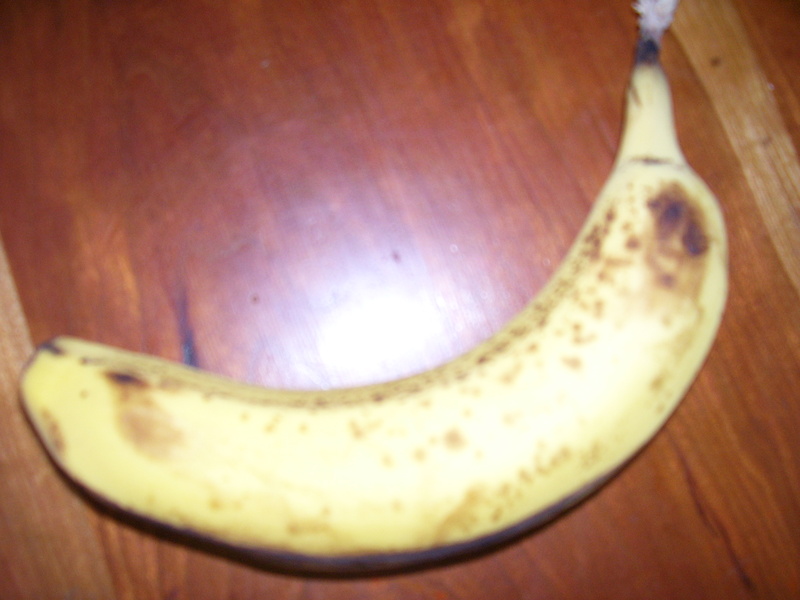 Anyway, one night Andrew (our 7 year old) wanted to bake something with our bananas that were getting old. They totally concocted this recipe on their own. Banana nut cookies (or just banana cookies if your household is avoiding nuts) may sound gross to some, but they turned out fantabulous. Since they made up the recipe as they went, Andrew recorded the ingredients afterwards on a piece of paper. Don’t worry, he consulted Daddy as he wrote, so the ingredients and amounts should be correct. 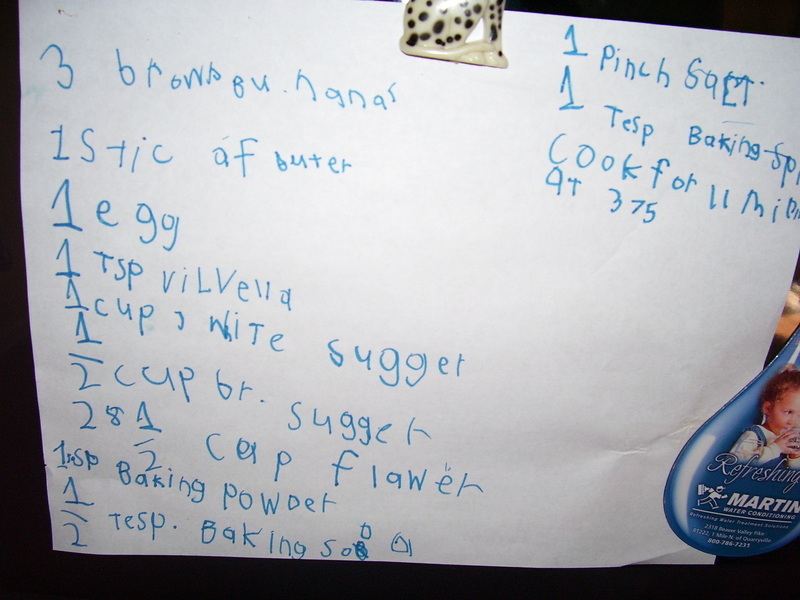 I’ve had it on the fridge since he wrote it–though I don’t want to condone wrong spelling, I did find it precious how he wrote some of the ingredients: “brown bunanas,” “1 stic of buter,” “wite sugger,” 2&1/2 cup flower.” Too cute. So go ahead, use up them “brown bunanas” and make a yummy little something today. Bake on 375 for 11 minutes. See this poster one of my kiddos made? Do the words on each heart look familiar to you at all? I may be hanging this up in my house for quite awhile, because it has a lot to teach me. Here’s the back story–we attended a Valentine’s party at our church on Saturday. A wonderful woman from our congregation (who is also a phenomenal teacher) put on a party for the preschool to elementary aged kids. One of the first activities she had them do was a “heart hunt.” You may want to do this with your gang as well! She had these colored hearts scattered around a certain area of the room our party was in. The kids were instructed to pick up one heart of each color, 7 in total. As they finished and each child had 7, they had a little learning time where they discussed what was on the hearts. I was completely impressed with some of those kids’ answers. 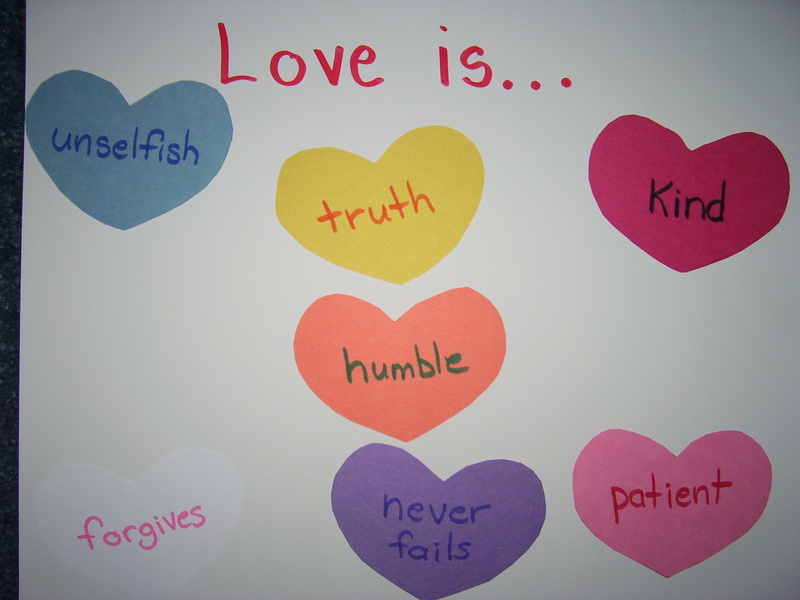 If you’re familiar with 1 Corinthians 13, also known as “the love chapter” in the Bible, you can see that each heart has an attribute of real love on it. I have to admit, there was a time when I heard this chapter of the Bible read aloud so many times, especially at weddings. To be honest with you, I was kind of sick of hearing it! However, there is a reason it’s read so much–it’s honest to goodness good stuff. Really. It didn’t strike me until someone else suggested putting the name Jesus in every spot where it says love. Yes, Jesus is patient. Jesus is kind…. Or, if you really want to challenge yourself to be more loving, try putting your own name in those spots where the word love is. I tried that and man, it was awfully convicting!! I asked myself, can I honestly say “Rachel is patient. Rachel is kind. Rachel does not envy, does not boast”and so on. No way am I all those things all the time!! I may be ok at some of them some of the time, but definitely not ALL of them. There’s some days where I would give myself a big fat F in all of those attributes. I fail myself, fail others, and am sure I fail God on a daily basis. I’m human. But you know what the beautiful part is? God IS love and He loves me no matter what! He is also very willing to forgive us for all of those times we mess up, all we have to do is ask Him. Another beautiful thing is that I can ask Him to help me be more loving and to show His love to others. He wants us to ask Him for help, and He will help lift us up in those areas where we can be weak. He can help us be more loving–to our spouses, our kids, our neighbors, even to someone you may find quite unlovable. God’s love is real! He loves you beyond what you can ever imagine. Accept that love today, bask in it, and ask God to help you display that true love to everyone around you. Happy Valentine’s Day everyone. 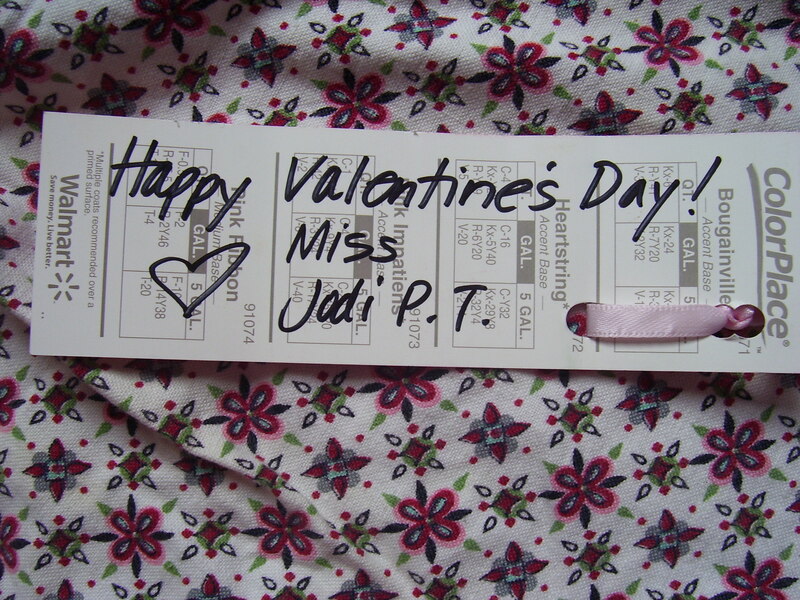 I just had to share this sweetly simple valentine idea with you all. My daughter, who is 5, brought this home from kindergarten yesterday. Her physical therapist at school gave this to her and I thought it was so stinkin’ cute! Not to mention cheap and easy!! Plus, even if you’re not “crafty,” you can SO pull this one off. At first I thought it was supposed to be a bookmark, as it had two holes punched in it. (No ribbon when it arrived, I thought Heidi must have just ripped it out.) So, I added my own and took pics of it. Afterwards Miss Heidi informed me that it had had a Valentine’s pencil stuck in those holes. So, I took pics of her holding it with the pencil as well. How easy is this? 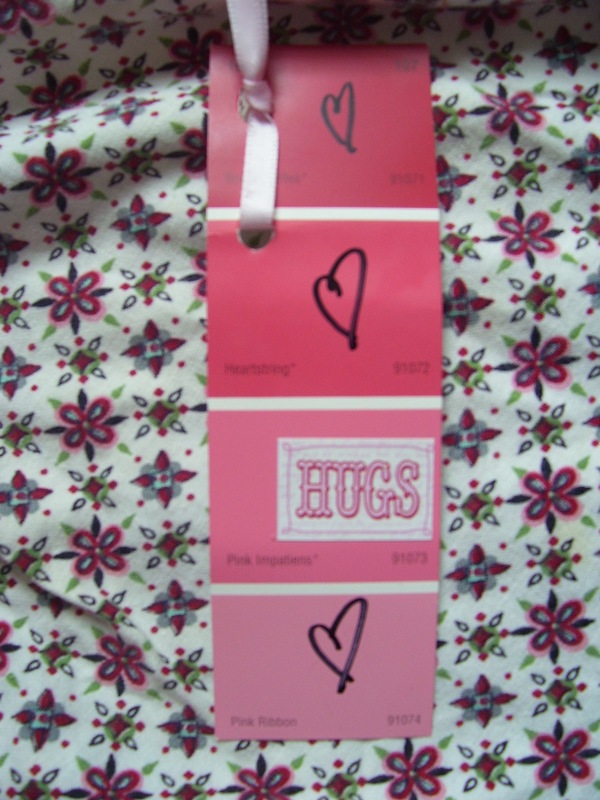 Just get yourself some paint sample strips, preferably in Valentine colors. (Maybe you have some lying around already.) Put a cute heart or some other Valentine-y sticker on one of the squares, draw some hearts, punch a couple of holes along one side (if you’re going to put a pencil in it.) Punch one hole at the top center if you’re planning on doing a bookmark. 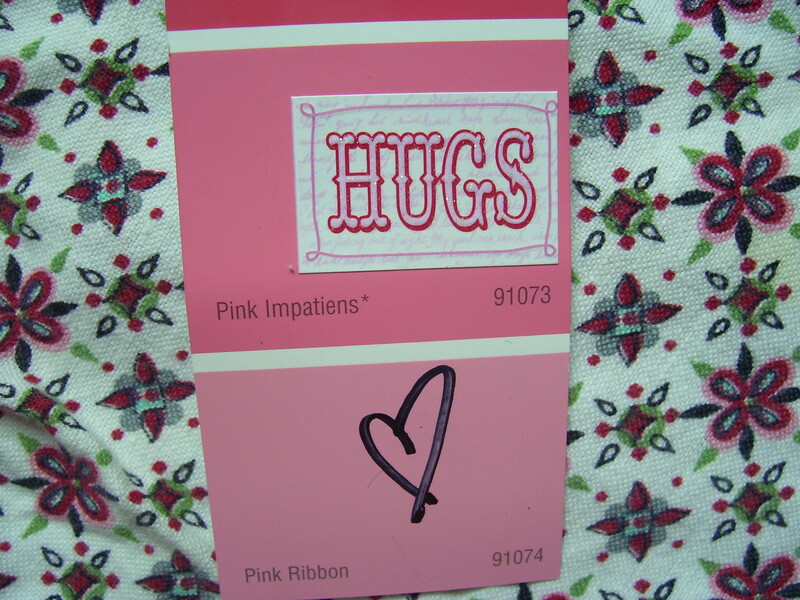 Heidi’s PT teacher wrote her little message on the back of the sample strip, but you can write it wherever. Insert your pencil, or thread a ribbon through the hole(s). Ta-Da!! 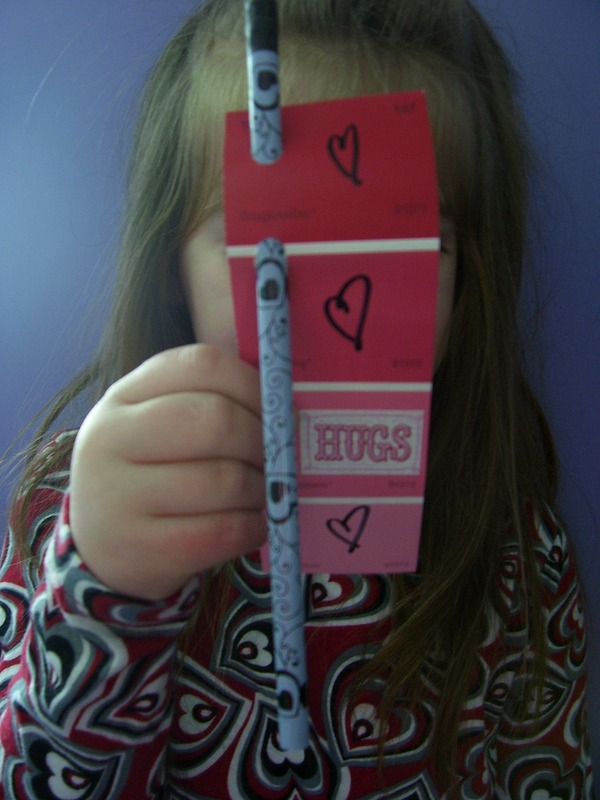 A quick, cute, easy, and cheap valentine! Thanks Miss Jodi for the fab idea!